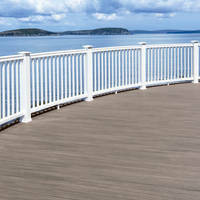 AZEK® Deck Colors are available in Coastline™, English Walnut™ and Weathered Teak™ variants. Units come with 30-year limited fade and stain and a limited lifetime warranty. Products are suitable for commercial and residential roof deck applications. AZEK® Building Products, No. 1 in premium decking, is unveiling three new deck colors at the 2018 International Builders' Show in Orlando, Florida from January 9th - 11th. Under the AZEK® brand, the three new Vintage Collection® colors include: Coastline™, English Walnut™ and Weathered Teak™. As homeowners continue to seek alternative building products that are not only durable and low-maintenance but also aesthetically pleasing, AZEK® Building Products remains an innovator in the industry. Scientifically engineered to last beautifully, AZEK's Vintage Collection has the most realistic, wood-like appearance, including diverse color palettes, realistic grain textures and superior durability. The Vintage Collection is backed by an industry-leading 30-year limited fade and stain and a limited lifetime warranty, and meets criteria for a Class A on the flame spread index. The lightweight boards make AZEK an ideal choice for both commercial and residential roof decks. "AZEK is committed to making sure that our dealers and contractors have the products and color options that keep pace with the evolving demands of homeowners, architects and designers. While the current range of colors in the Vintage Collection has been extremely successful and continues to grow, we also see emerging demand for additional on-trend colors," said Patrick Barnds, SVP of AZEK Building Products. "While AZEK's performance is unmatched, we know the aesthetic of our product can truly make or break a customer's decision to buy. As outdoor spaces continue to be extensions of a home, we are always focused on providing new options that create a balance of form and function." Also at IBS, AZEK is announcing a new fastening line for its decking and fascia. TOPLoc® for AZEK is a new stainless-steel screw featured in eight colors to complement AZEK Deck collections. AZEK is also showcasing its FUSIONLoc™ hand driven fastening system and Collated Cortex® hidden fastening for AZEK Deck at IBS. To see all the new AZEK products, stop by booth #W6371 or visit AZEK.com.